Moog Moogerfooger MF-104M Review – Best Analog Delay Pedal? Behold… the Moog Moogerfooger MF-104M Analog Delay. The original MF-104 and its successors, the MF-104Z and MF-104SD, have become highly sought instant classic pedals. Now the latest and ultimate version of this legendary delay pedal has arrived in the MF-104M. The Moogerfooger MF-104M features the exact same vintage “Bucket Brigade” delay chips as the original MF-104, providing up to 800ms of the warmest all-analog delay you’ll probably ever hear. The original MF-104 was limited to only 1,000 units, becoming a treasured collector’s item in the years following its production. And with these vintage chips becoming ever more elusive, the MF-104M may very well be the final incarnation of this incredible delay pedal. In addition to its ecstasy inducing sound quality, this pedal features an unrivaled amount of functionality in an all-analog delay pedal. Is it the best analog delay pedal out there? We’ll help you answer that question in our in-depth Moog Moogerfooger MF-104M review. But first, let’s run down the list of what all this pedal has to offer before we dive in. Uses the same vintage “Bucket Brigade” chips as the original MF-104. Tap Tempo for Delay Time or LFO Rate. Bypass footswitch with optional Spillover mode for delay trails that ring out after the effect is bypassed. ¼” Jacks for Audio In, Mix Out, Delay Out, and FB Insert. Expression Pedal control jacks for Feedback, Time, LFO Rate, Mix, and LFO Amount. MIDI Input Jack for controlling all parameters. Power by included 9VDC 400mA adapter. Visit Moog for more info about the MF-104M Analog Delay & Super Delay. See the best price on Amazon. See the best price on eBay. I must say, I don’t think I’ve ever been as excited about a delay pedal as I am about the MF-104M. And as excited as I was to get my hands on this pedal, this is the first time I didn’t just plug in and start jamming. No, not this time. This pedal inspired something completely different. From the moment you first open the box of a Moogerfooger, you can’t help but be awestruck at how beautiful these pedals are. The Moog MF-104M Analog Delay features a level of craftsmanship that is unrivaled in the world of guitar effects pedals. With its sophisticated, retro synth styling and sleek hardwood borders, the MF-104M Analog Delay is as much a work of art as it is a musical instrument. I couldn’t help but set it on my desk and admire it for a few days before I finally worked up the nerve to plug it in. When you first plug in the MF-104M, it’s recommended to get your input and output levels set first. With the Delay and LFO effects rolled off, you can push the drive up until the middle Level light flashes green with just a hint of orange. The Drive knob of the MF-104M lets you set the perfect signal level or add a bit of grit for an even warmer analog tone. Adjust the Output Level knob to unity gain and you’re good to go. From here you can push up the Delay Time around noon or so and set the Feedback to 1 or 2 repeats to start getting a taste of how this pedal sounds. Adjust the Mix knob to blend the dry and delay signals. I found a great starting point with the Mix set around 10 or 11 o’clock for a delay that sits right under my dry signal. The MF-104M produces an absolutely beautiful analog slapback delay that is among the best I’ve heard. The Short/Long switch offers an easy way to essentially double or half your delay time. But more importantly you can use this function to color the sound of your delayed repeats. The Short position offers the higher frequency response, while the Long setting is generally a bit darker in tone. There is plenty of overlap in the range of the Short and Long positions for setting the delay time with the Time knob. Both options sound beautiful, so it’s just a matter which character you need for any given application. The delay sounds of the MF-104M are warm and musical, adding a depth of character to your sound that will glorify your overall tone. Once you hear the added dimension of sound and warmth offered by the MF-104M, it’s hard to take seriously those digital pedals offering “analog” style sound. Make no mistake, if you want real analog delay tone of the highest caliber, the MF-104M delivers in spades. One of my favorite features about this pedal is the Spillover mode. By pressing and holding the Bypass footswitch, you’ll see the Bypass LED change from green to orange. This indicates that the MF-104M is in Spillover mode which allows the delay repeats to continue after the pedal has been bypassed. The Spillover mode can be quickly toggled on and off with your foot for those moments when you need tight delay stops or cascading repeats over the next song section. Tap Tempo is a very welcome addition to Moog’s latest delay, offering a simple way to set precise delay times that sync to the music. For me, Tap Tempo is definitely an essential feature for any performance delay. Three rhythmic taps on the footswitch with your foot will cause the pedal to switch from the rate set from the Time knob to the tapped out delay time. Simply turn the Time knob again if you want to switch back to manual time control. This pedal is already a top-notch product, and I haven’t even talked about the LFO or expression pedal control yet. The LFO section offers the ability of modulate your delay sound in several different ways. With the Sine waveform, you can achieve chorus-like delay effects with lower Rate and Amount settings. This adds a nice level of movement to your delay sound which is very pleasing to listen to. You can use the Triangle wave to get some interesting tape-stretching effects. The Square wave lets you achieve wide interval pulsing effects. A pair of ramps sends your repeats up into the stratosphere of deep into the depths. And the last waveform offers random fluctuations for all kinds of glitchy mayhem. The LFO can range from subtle and musical to otherworldly and bizarre. The MF-104M’s LFO definitely rewards the sonic experimentalist, revealing endless creative possibilities to those who plunge the depths of this performance instrument. You can also use the Tap Tempo footswitch to control the LFO Rate. Simply press and hold the footswitch, and the Rate LED change from orange to green to indicate that the Tap Tempo is controlling the Rate. Tap in your tempo, and you’re pulsing in time. Press and hold the footswitch again if want to switch control back to controlling Delay Time. Despite its complex possibilities, the MF-104M is surprisingly intuitive and easy to use. Kudos to the engineers at Moog for constantly improving on their designs in ways that greatly benefit the end user. While the Moogerfooger pedals are great for knob turning, they beg to be used on the floor with expression pedal control. I hooked up dual expression pedals to experiment with what the MF-104M has to offer. You can achieve all kinds of ethereal and chaotic sounds by controlling one or more parameters with expression pedal control. My favorite parameter to adjust is Delay Feedback for some self-oscillating repeats that cascade into white noise. The pedal lets you reign in the wall of sound when it reaches its useful limit. Another ingenious function of this pedal is the FB Insert and Delay Out jacks. You can send the delay to the separate amp for true stereo operation or add in another effect to color the delayed repeats. This is great for you sonic pioneers out there. They using various distortion or modulation effects on the wet signal. The possibilities of this pedal are limited only by your imagination. Moog has created a real treasure trove of delay possibilities with the MF-104M, and it’s a testament to the good decision the legendary synth maker getting into guitar pedals. Let’s see the final result. The Moog MF-104M is another true gem of the Moogerfooger line. This is an analog delay pedal of the absolute highest quality. Moog has packed in nearly every possibility conceivable in an analog delay and made it surprisingly easy to use. Tap Tempo – it’s here. Delay trail spillover – it’s got it. Send and Return, Stereo Operation, LFO modulation, deep expression pedal control, MIDI – the MF-104M Analog Delay does it all. If you’re looking for the best analog delay pedal available, this just might be the one for you as no other all-analog delay in existence offers this much functionality. 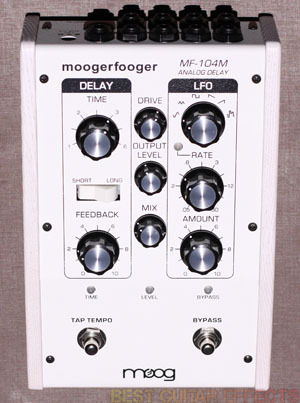 The Moog Moogerfooger MF-104M Analog Delay is a must-have. That concludes our Moog Moogerfooger MF-104M Analog Delay review. Thanks for reading. Want to buy a Moog MF-104M? Looking forward to hearing reviews of the Minifooger line of pedals.